Public Safety Commissioner Tom Anderson speaks at a traffic safety press conference in Waterbury on Tuesday. 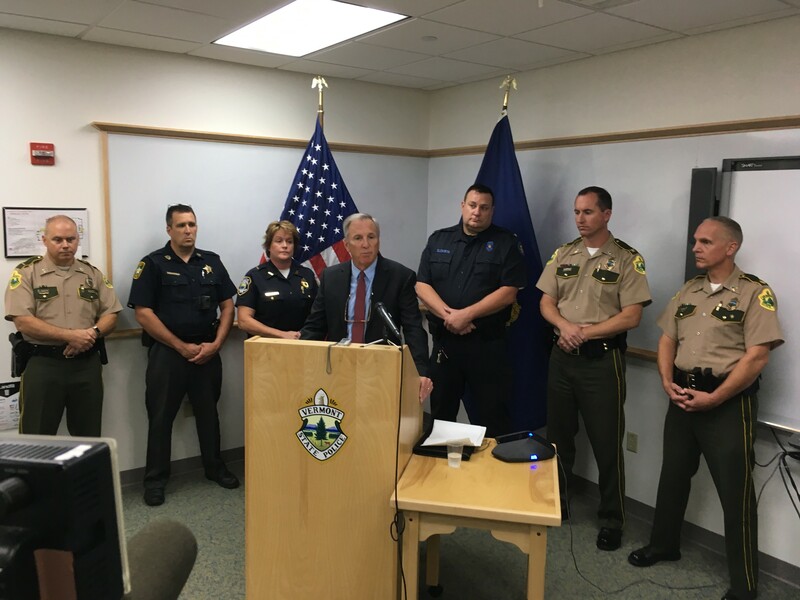 Vermont drivers can expect to see increased traffic patrols in the coming days after nine people died in motor vehicle collisions across the state since Friday night, law enforcement officials said Tuesday. Vermont Public Safety Commissioner Tom Anderson said that the "startling" spate of fatal wrecks demonstrates the dangers of distracted driving and failing to wear a seatbelt. Seven of the nine people killed were not wearing a seatbelt, officials said, including four young people who died Monday morning on Route 22A in Bridport. Officials said their Volkswagen Beetle crossed the centerline and slammed head-on into a pickup truck. It's too early in the various investigations to determine whether drivers were distracted or under the influence, authorities said. Both the Vermont State Police and local police departments will step up traffic patrols in the coming days, according to Anderson, who acknowledged their impact will be limited. "What you're going to see is increased visibility," Anderson said. "That will have an effect, but probably a short-term effect. We'll do our part ... but this is the responsibility of every driver." Thus far in 2017, some 57 percent of people killed in Vermont traffic collisions were not wearing seatbelts, state police Lt. John Flannigan said. That rate is slightly higher than in prior years. Police did not release an updated tally of traffic deaths this year. Officials noted that Vermont, unlike some states, does not consider failing to wear a seatbelt a "primary offense." Instead, it's enforceable as a so-called "secondary offense" — punishable by a $25 fine — only if a driver is pulled over for another infraction. Anderson stopped short, at least for now, of calling for legislators to change the penalty. "I don't know if this is a matter of new laws or enforcement of existing laws," he said. "It's not going to be the be-all, end-all to change drivers' behavior. It's going to be the decisions of each Vermonter to say, 'I'm going to buckle up and make sure my passengers are[, too.]'" Colchester Police Chief Jennifer Morrison, representing the Vermont Association of Chiefs of Police, said her group is scheduled to meet Wednesday and would likely discuss seatbelt laws. Officials said they were unsure if the recent rash of fatal collisions was a random series of events, or the beginning of a trend. "I don't know if it's predictive of what's going to happen going forward," Anderson said. In addition to the Bridport wreck, Vermont State Police said the fatalities included a 26-year-old man who slammed into a tree Sunday evening off of Interstate 91 in Springfield; a 38-year-old passenger killed Friday night in a one-car wreck in South Royalton; a 57-year-old man found Monday pinned under an ATV in Andover; a 51-year-old driver who died Monday morning in a one-car crash on I-89 in Milton; and a 36-year-old man whose vehicle collided Monday with a dump truck in Brownington.